Data Acquisition involves sampling and it is mandatory that frequencies higher than half the sampling frequency be removed. This ensures that there will be no errors due to aliasing in the acquired data. Antialiasing filters hence form an essential part in data acquisition systems. 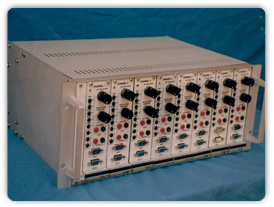 In addition, mains frequency interference often poses problems in acquisition of low-level signals. System Controls has developed a multichannel antialiasing filter with cut-off frequency of 40/80 Hz and rejection at 50 Hz. The filter has Butterworth low pass characteristics and provides an attenuation rate of 120 dB per decade.